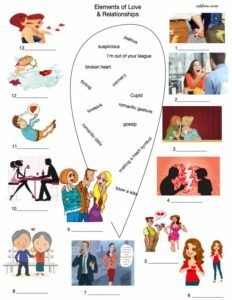 This is an English language exercise introducing and exploring the vocabulary and common expressions used to talk about love and romance. Students try to match the vocabulary with the appropriate pictures. This can be followed up by a speaking activity in which students have to explain what is happening in each of the pictures. I guess this would be a pretty good exercise for Valentine’s Day. This is an ESL speaking and writing lesson for talking about friendship. First, students choose five survey questions about friendship from the examples on the worksheet. Alternatively, they can think of their own questions. When they have written five questions on, they can walk around the class asking classmates their questions and noting down their answers on the worksheet. 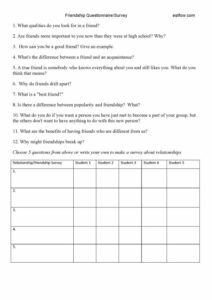 Finally, they can discuss the most common and unusual ideas about friendship in the class This is a fun communicative exercise that allows students to mix freely. This is an English language exercise exploring the language of love and romance. The pictures show common romance and love situations. Students use their own ideas to fill in the speech bubbles.